Security metrics is the application of quantitative, statistical, and/or mathematical analyses to measuring security functional trends and workload. In other words, tracking what each function is doing in terms of level of effort (LOE), costs, and productivity. Security metrics management is the managing of an assets protection program and related security functions through the use of metrics. It can be used where managerial tasks must be supported for such purposes as supporting the security professional’s position on budget matters, justifying the cost-effectiveness of decisions, determining the impact of downsizing on service and support to customers, etc. Security Metrics Management is designed to provide basic guidance to security professionals so that they can measure the costs of their assets protection program - their security program - as well as its successes and failures. 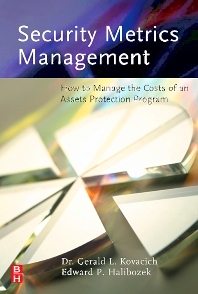 It includes a discussion of how to use the metrics to brief management, justify budget and use trend analyses to develop a more efficient and effective assets protection program. Dr. Gerald L. Kovacich has more than 40 years of experience in industrial, business and government security, investigations, information systems security, and information warfare, both in the U.S. Government as a special agent, in international corporations, and subsequently as an international consultant and lecturer. He retired as the Information Warfare Technologist, Northrop Grumman Corporation to pursue a career as an international consultant, lecturer and writer. Edward P. Halibozek is currently a corporate vice president of security for a Fortune 100 company headquartered in Los Angeles, California. He holds a Master of Science in Criminal Justice and an MBA in business. Mr. Halibozek is an experienced lecturer and has written and published many articles, papers, plans, policies and procedures related to corporate security. Mr. Halibozek is the former Chairperson for the Aerospace Industries Association, Industrial Security Committee and is a member of the Board of Directors for the Chief Special Agents Association in Los Angeles California. Mr. Halibozek served for four years as an Industry member to the National Industrial Security Program Policy Advisory Committee (NISPPAC).